As opposed to "apparently eternal kingdoms" like England, France, Denmark, Poland, Hungary etc. I've seen it spelled both ways in various books. A similar issue occurs when spelling a name of morganatic (in)famy: Zarnekau (ancient Slavic name deried from чёрный, black, and pronounced /'tsarnekau/ in German) in Russian. Should it be spelled orthographically, as Зарнекау, or phonetically as Царнекау? The word for "outside of Russia" in ROCOR = Zarubezhnaya. Alternatively and officially evidently also Русская православная церковь заграницей - zagranitsey - as in граница / granitsa = German Grenze (= border) - evidently a Slavic loanword (seen in the East German placename Granitz, which like most German -itz names not surprisingly are feminine!) How marvellous isn't that, that German (and thereby the Scandinavian languages) borrowed that word from Slavic! Think of all those Germanic - Slavic borders... from the Dark Age Limes Saxoniæ in Holstein to Российско-норвежская граница - den norsk-russiske grensen (the Russo-Norwegian border) by the Barents Sea - the world's most peaceful border between a major power and a small country - undisturbed since it was established by Bernadotte / Carl XIV Johan and Nicholas I in 1826. Speaking of German and Slavic and the thread's cæsarian topic it's funny how misleading the царица / tsaritsa - Zarin / czarina / tsarina confusion would be applied to other Russian words: Pодина / rodina means nation, fatherland, motherland, homeland while (Бого)родица / (Bogo)roditsa means (God-)bearer (Theotokos / Mother of God). In my effort to list all the provinces, cities, etc., I forgot to add the official introduction to the emperor's titles to my post. I hope that my translation is accurate as I had great difficulty finding the exact words in my dictionary. The title of the Russian Monarch is Emperor and Imperial Majesty. Originally the Russian Sovereigns bore the title of grand dukes. With the uniting of Russia under the dominion of Moscow, the title of Tsar began to be used, and was, definitely adopted by Ivan IV in 1547. 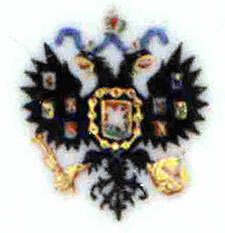 This remained the title of the Russian Sovereigns unil 1721. In 1721, by the peace of Nishtadt, the Great Northern war, carried on so successfully by Peter the Great, was concluded. In celebration of this event, the Senat and Synod resolved t beg Peter I to accept the titles of Emperor, Great, and Father of his Country. A supreme Ukas was issued to that effect, on November 11, 1721, which gave rise to a protest on the part of many European states, as it placed the Russian Sovereign on the same level with the Emperor of Germany, the sole Monarch of that rank then existing. First to acknowledge the new title were Prussia, the Netherlands and Sweden, last - Poland in 1764. In celebration of this event, the Senat and Synod resolved t beg Peter I to accept the titles of Emperor, Great, and Father of his Country. A supreme Ukas was issued to that effect, on November 11, 1721, which gave rise to a protest on the part of many European states, as it placed the Russian Sovereign on the same level with the Emperor of Germany, the sole Monarch of that rank then existing. First to acknowledge the new title were Prussia, the Netherlands and Sweden, last - Poland in 1764. King Władysław IV of Poland claimed from 1610 and onwards, in competition with the first Romanov tsar, to be not only "elected Grand Duke of Moscow", but sometimes even "obrany wielki czar moskiewski" - elected grand tsar of Moscow"! Note the contemporary Polish spelling czar - today car. All untill Poland was finally dismantled in 1795, the Kings of Poland claimed to be Grand Dukes of Kiev, Smolensk, Severia and Chernigov, territories that had been lost to Russia in the 17th century, even of Russia, although this "Russia" referred to an ill-defined Red / Black / White Rus in modern Ukraine - Belarus - southeastern Poland. На каких фото Император на яхте Александрия, а не на Штандарте ? Which photos Emperor yacht Alexandria, rather than on the Standard? По Вырубовой фото на яхте Полярная Звезда. ..
By Vyrubova photos on a yacht Polar Star. ..